Bone Density or DEXA is a non-invasive, enhanced x-ray imaging that measures bone loss. During the procedure, patients are exposed to a small dose of ionizing radiation. 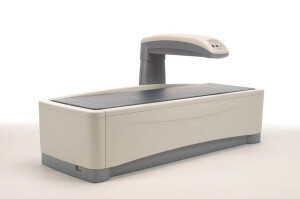 The scan measures bone mineral density. DEXA is most commonly used to diagnose osteoporosis, which involves gradual structural changes and loss of calcium in the bones, causing bone to become thinner and more fragile to breakage. DEXA aids physicians in assessing the risks of developing fractures, which is influenced by patient’s age, weight, family history of osteoporosis, history of fractures, and life-style risk factors. You may be asked to remove some or all of your clothing and be asked to wear a gown. You may also be asked to remove jewelry, dental appliances, eye glasses, and any metal object that may interfere with the imaging. ** It is important to inform physicians and x-ray technicians if a woman believe she is or may be pregnant. Some medical imaging are not performed during pregnancy to reduce exposure of radiation to the fetus. If an x-ray is needed, precautions are taken to minimize the exposure to the baby. Please consult with your physician and/or radiologist for detailed instructions or any concerns regarding on how to prepare for your DEXA scan.